The Sport of Politics...Becomes the Politics of Sport : Blog Of The Nation Can we honor the age old notion of the Olympic truce, or will politics always be a part of the games? The Olympic truce -- whether it's a myth or not -- is one of Western civilization's most cherished ideals. The ancient truce -- called Ekecheiria -- was reportedly honored by the Greeks and their neighbors during the ancient Olympics. It facilitated safe travels and a cessation of hostilities for athletes, visitors, poets and others during the games at Olympia. The current Olympic truce is probably both more and less stable -- heavy security prevents (but not always, see Black September) actual violence; and Rule 51 of the Olympic Charter explicitly states, "No kind of demonstration or political, religious or racial propaganda is permitted in any Olympic sites, venues or other areas." That has not prevented politics from seeping into the games. 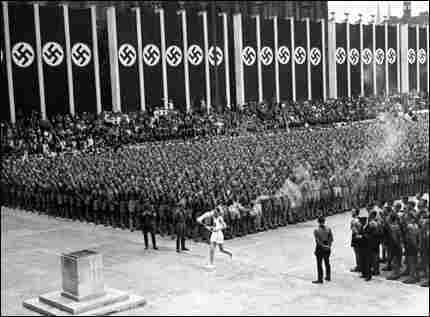 Hitler's 1936 games were meant to prove Aryan superiority -- and famously didn't. Black Americans Tommie Smith and John Carlos, who finished first and third, respectively, in the 200 meter-run, bowed their heads and gave the Black Power salute during the national anthem as a protest against racism in the U.S. (you can see a photo of that moment on our main website).A reciprocal boycott kept the Cold War chilly at the games in Moscow and L.A. in the eighties. And now, the Beijing summer Olympics threaten to be the most political games yet -- Hollywood heavyweights are weighing in for the Olympic sport of protest, and athletes are preparing to confront China's record on the environment, human rights and Sudan. Today we're looking forward by looking back (Tommie Smith!) -- do you think the Olympics should be a moment of truce, of noble competition unsullied by politics? Or are they the perfect venue for such displays?